Spacious castle with elegant staircase which reaches up to tower rooms. The horse-drawn carriage (item 6856) can enter through the gates into the inner courtyard. Measurements: 81 x 40 x 68 cm. Price is 33% below the initial Playmobil retail price, a € 53.49 discount! 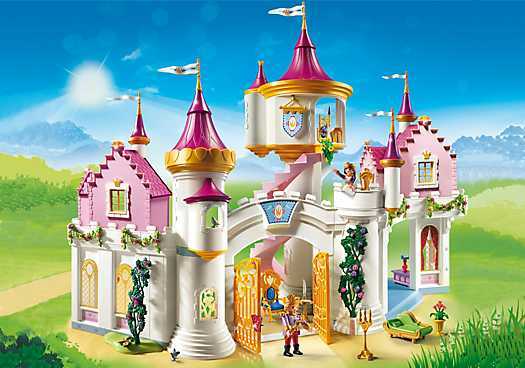 The Grand Princess Castle (6848) Playmobil set is available from the sites below. However, they do not offer delivery to your selected region. The Grand Princess Castle (6848) Playmobil set is no longer directly available from the sites below. However, 3rd party partners of these sites might still have the set available. Horse-drawn carriage (item 6856) can pass into the inner yard through the gate. Five pink rhinestones decorate the gables as well as the door lock.